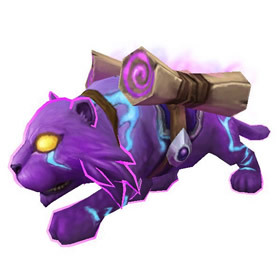 It was announced during BlizzCon 2015 that a new pet would be available from the Blizzard Store this winter, and that pet has arrived — Brightpaw! This little mana kitten is sure to brighten up any collection. Through December 31, 2015 all proceeds of this pet will be donated to the Make-a-Wish Foundation, a non-profit organization. Whether you're adopting Brightpaw for yourself, gifting one to a family member or friend, or doing both, know that your purchase will be going to a charitable cause. Take advantage of this sale and collect the Recruit-a-Friend (RAF) pets (pictured above) at a reduced price. Save 75% on the digital versions of WoW — this brings the WoW Battlechest to $4.99 USD (regular price is $19.99). Note that you only need the WoW Battlechest to complete the process for the RAF rewards; the Warlords of Draenor license is not necessary on the RAF accounts. Also, it's possible to gift the WoW Battlechest to someone else, or to yourself for use at a later date. For more information on collecting the RAF pets, check out our forum thread discussion. The sale ends January 4, 2016 at 11:59 p.m. PST, but best not delay. What better gift for the holidays than the gift of new pets! You also need to pay for 2 months subscription to get the RAF rewards. Just buying a battlechest does not do it. No post about the pets/mounts 50% off sale? Now's the time to buy, if you're missing any from the store! Gifting Brightpaw is now available! Just FYI, currently purchasing her will not count as a unique pet for your 600 pet achievement. I would have purchased Brightpaw anyway, but so great to have it support a wonderful cause. SOOO cute. Just wish it they'd made it so it could fly with my Mystic Runesaber mount!